At the 25th General Assembly of the International Union of Geodesy and Geophysics (IUGG), the Chinese National Committee released an overview of data on Chinese volcanoes, especially Changbaishan volcano (figure 3), which they considered the most dangerous and the most likely to erupt (Fan and others, 2011; Liu and others 2011). Focusing on Changbaishan volcano and its summit caldera called Tianchi, Tianchi Volcano Observatory (TVO) released data collected since it formed in 1999. This report will summarize both the TVO's monitoring network and their findings from 1999 to 2010, focusing on the seismic crisis during mid-2002 to mid-2005. As clarification, the name Tianchi is used to refer to the ~ 5 km diameter summit caldera vent of the volcanic complex, and the name Changbaishan is used to refer to the complex in general. The latter name has many synonyms, including Baegdu, Baekdoosan, Baitoushan, Chang-pai-shan, Hakuto, and P'aektu-san. Figure 3. Geographic position of Changbaishan volcano, situated on the border between China and North Korea. Adapted from Machida and Arai (1983). To continuously monitor seismicity, TVO's Changbaishan volcano center was built in the highlands 40 km from the volcano, and five, two, and four seismic stations were installed within 15, 25, and 50 km of the volcano, respectively. Liu and others (2011) report that TVO's system "can detect M 0.1 volcanic events and give the [detailed] location of M 1.0 and larger volcanic events." Seismic crisis. Our previous report on Changbaishan briefly discussed an increase in seismicity centered at the volcano in 2003 (BGVN 35:08). Figure 4 and table 1 illustrate that the increased seismicity occurred both in terms of the magnitude and the number of seismic events recorded. A histogram of the annual number of earthquakes from 2002 through 2005 shows a peak in 2003. M 2 and larger earthquakes became common in 2002, and peaked in late 2004. Note that tectonic earthquakes of M 4.4 and 4.0 occurred on 17 December 2004 and 15 April 2005, respectively, and are not related to this trend or Tianchi volcano (Liu and others, 2011). Following the seismic crisis, the number of earthquakes declined slowly, reaching background levels by 2006 (Liu and others, 2011). Liu and others (2011) break the seismic data into three periods over the TVO monitoring history (table 1). As is common with earthquakes at volcanoes around the world, seismic activity at Changbaishan often occurred in swarms, especially from 2002 to 2003, when hundreds of seismic events were sometimes recorded within a single day (figure 4, table 1). Figure 4. Time distribution of seismic events recorded at Tianchi volcano (Changbaishan) from mid-1999 to mid-2010. Top plot indicates magnitude of each seismic event; bottom plot indicates number of seismic events per year. From Liu and others (2011). Table 1. Tianchi volcano observatory (TVO) detected three distinct seismic episodes. * = Not including tectonic earthquakes of M 4.4 and 4.0 that occurred on 17 December 2004 and 15 April 2005, respectively. From Liu and others (2011). 1999-Jun 2002 Background 1.5 Under 12/month. Jul 2002-Jul 2005 Peak (crisis) 3.7* Over 100/day, in a series of swarms. Aug 2005-present Recovery -- Under 12/month, generally. The hypocenters of earthquakes occurring at Changbaishan, and specifically the Tianchi caldera, were calculated from 2001 to present (figure 5). The majority of the earthquakes originated within 3 km of the Tianchi caldera rim (map distance), and within 5 km depth from the caldera rim. Figure 5. Calculated hypocenters for earthquakes occuring at Changbaishan volcano since 2002. (Top) plan-view distribution: triangles are seismic stations, red circles are hypocenters. (Bottom) depth distribution: colors from green to red indicate increasing depth (0 = sea level). Most earthquakes originated directly under the Tianchi caldera, within 5 km of the surface. From Liu and others (2011). Coinciding with the increased seismic activity from July 2002 to July 2005, the ground deformation of Changbaishan also entered into a period of inflation, as measured by GPS instruments (figure 6). Horizontal displacement reached a maximum of 4 cm between 2002 and 2003, and continued on a declining trend (figure 6; Liu and others, 2011). Similarly, vertical displacement reached a maximum of 38.6 mm between 2002 and 2003, and declined in the following years; a cumulative vertical displacement of 68.12 mm was measured from 2002 to 2005 (Liu and others, 2011). Vertical displacements of the N and W slopes of the volcano (measured once per year from 2006 to 2009) are presented in table 2. Figure 6. Horizontal displacement from GPS surveys from 2000 to 2007, showing inflation at Tianchi caldera of Changbaishan volcano. Reference arrow at the top of each frame is 10 mm/yr. From Liu and others (2011). Table 2. Vertical displacement measurements of the N and W slopes of Changbaishan, measured once per year from 2006 through 2009. From Liu and others (2011). Magma source of Changbaishan. TVO monitored the gas flux of (among others) CO2, N2, He, H2, O2, and CH4, as well as the temperature of hot springs as a supplementary data set. Of particular interest is the measured helium (He) isotopic ratio, 3He/4He. The isotope 3He is often considered primordial. The concentration of 3He on Earth is considered to be essentially stable; the majority of 3He on Earth was trapped upon the formation of the Earth. 4He is a product of the alpha decay of heavy elements in the Earth's crust, and is still produced on Earth by alpha-particle emissions from heavy elements that have differentiated into the Earth's crust and then escape into the atmosphere. The mantle is depleted (relative to the crust and atmosphere) in 4He. 3He/4He ratios (R) of volcanic gases are compared with the common atmospheric 3He/4He ratio (Ra). If volcanic gases provide a particularly high R value (e.g., R = 5, or 5 Ra, indicating values 5 times the atmospheric 3He/4He ratio), then they are considered to be of mantle origin (i.e., depleted in 4He). Liu and others (2011) reported an average 3He/4He value of 5.61 Ra, and concluded that the gases being monitored are mantle sourced. Liu and others (2011) also reported that He and H2 gas flux increased significantly in 2003 and 2004, associated with the above-mentioned increased volcano-seismicity of July 2002 to July 2005. They also reported He and H2 gas flux increases in October and November 2006, again associated with volcano-seismicity (as well as an M 2.6 tectonic earthquake on 11 November 2006). From fluid geochemistry measurements, Liu and others (2011) reported that H2S and SO2 fluxes are low but suggested monitoring should increase in the event that the measured values increase. References. Fan, Q., Sui, J., Zhao, Y., Li, N., and Sun, Q., 2011, Recent progress in active volcanoes in China, in China National Report on Volcanology and Chemistry of the Earth's Interior, for the 25th General Assembly of IUGG, Melbourne, Australia, 28 June-7 July 2011 (prepared by the Chinese National Committee for the International Association of Volcanology and Chemistry of the Earth's Interior (IAVCEI)), pgs. 15-18. Liu, G., Yang, J., Wang, L., and Sun, J., 2011, The active level analysis of Changbaishan volcano, in China National Report on Volcanology and Chemistry of the Earth's Interior, for the 25th General Assembly of IUGG, Melbourne, Australia, 28 June - 7 July 2011 (prepared by the Chinese National Committee for the International Association of Volcanology and Chemistry of the Earth's Interior (IAVCEI)), pgs. 19-43. Machida, H., and Arai, F., 1983, Extensive ash falls in and around the Sea of Japan from large late Quaternary eruptions, Journal of Volcanology and Geothermal Research, v. 18, p. 151-164. Information Contacts: Changbaishan Tianchi Volcano Observatory (TVO), Antu 133613, China. The Global Volcanism Program has no Weekly Reports available for Changbaishan. A news report on 3 November noted that gas emissions from the summit are frequent, many minor volcanic earthquakes have been felt during the last two years, and nearby hot springs were also emitting volcanic gases. The official Xinhua News Agency quoted Ruoxin Liu from the State Seismological Bureau, but we have received no direct confirmation. Charles Dunlap, Susanne Horn, and Hans Schmincke worked on and around the summit with Chinese geologist Tang Deping during 21-25 July 1993, but saw no emissions. 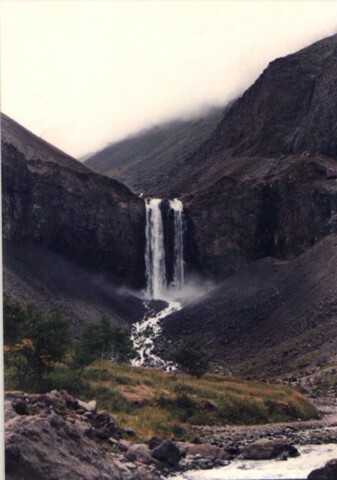 One hot spring area was observed by Dunlap in the N-flank valley, which begins at the lake outlet into the Erdobaihe River. These springs were next to the trail to the waterfall and on up to the lake's edge; eggs were boiled in the spring water for sale to tourists. A weak sulfur smell was detected, but it was not as pronounced as at some springs in Yellowstone or Long Valley (USA). No other emissions were noticed from these springs. Another hot spring location W of this valley was not visited, but apparently it is popular as a bath. On the E border of the crater lake (Korean side), water from a hot spring with a temperature of 700°C was being pumped to the crater rim to provide healing potions. Baitoushan (Korean name P'aektu-san) is a large stratovolcano on the Korea-Manchurian border ~300 km SE of Changchun and 325 km WSW of Vladivostok, Russia. The 60-km-diameter volcano was constructed over the Changbaishan (Laoheidingz) shield volcano and has a 5-km-wide summit caldera. One of the world's largest known Holocene explosive eruptions took place around 1000 A.D., depositing tephra as far away as N Japan and forming in part the 850-m-deep depression filled by Tianchi Lake. The much better exposed pyroclastic deposits on the North Korean side studied by Horn and Schmincke are extremely thick and include major ignimbrites. Four historical eruptions have been recorded since the 15th century (1413, 1597, 1668, and 1702). Chinese geologists spoken to by Dunlap thought that these historical events were probably phreatic explosions, and that there have possibly been occasional gas emissions within approximately the last 50 years. Information Contacts: C. Dunlap, University of California - Santa Cruz; S. Horn and H. Schmincke, GEOMAR; Xinhua News Agency, China; UPI. A recent article in Science (Stone, 2010) discussed possible signs of seismic unrest at Changbaishan volcano, on the border between China and North Korea (figure 1). The volcano has numerous synonyms, including Baegdu, Paedu, P'aektu-san (Korean), Baekdoosan, Baitoushan, Chang-pai-shan, Hakuto, and Tiachi (Chinese). Its last recorded explosive eruption occurred in April 1903. Figure 1. Changbaishan tephra blanket (envalope and thickness) related to the ~1,000 CE eruption. Revised by Zou and others (2010) after Machida and Arai (1983). According to the article, in June 2010 a South Korean geologist announced that Changbaishan showed signs of activity. North Korean scientists were concerned about recent geophysical anomalies observed at their monitoring stations. Stone (2010) quoted Chinese volcanologists as saying they have a "sophisticated monitoring system set up at Changbai" but that they "discount the threat and insist that the volcano is quiet." A meeting between South Korea, China, and Japan is planned in November 2010 to study this issue and to address the question of data sharing. The article also noted that an eruption of Changbaishan could have devastating consequences. Xu Jiandong, director of the China Earthquake Administration (CEA) Active Volcano Research Center in Beijing, was quoted as stating that, of China's 14 active volcanoes, "Changbai poses the biggest hazard." Part of the risk is the threat of lahars from the huge lake in the 5-km-wide caldera (Lake Tianchi - Sky Lake). About 100,000 people live on or near the slopes, with the addition of many tourists in summer (figure 2). Figure 2. Tourists peer over the rim of the Tianchi caldera at Changbaishan. Courtesy of Stone (2010). Xu noted that "In quiet periods, seismometers register about 100 small tremors a year around the mountain. 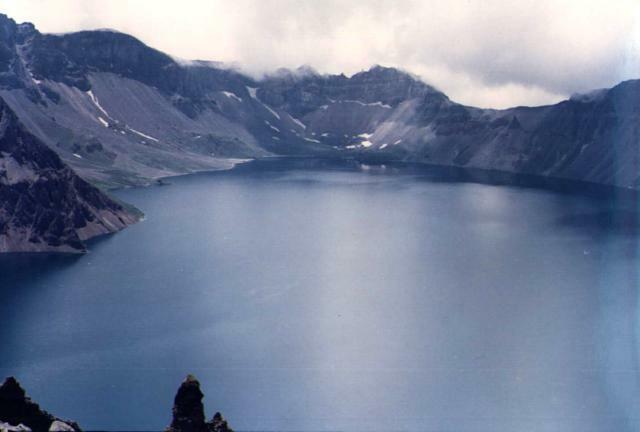 In 2003, Changbaishan Tianchi Volcano Observatory [on the N slope] recorded 1,293 tremors. By 2006, the frequency had receded to background rate, and in the first 6 months of 2010 the station recorded 58 tremors. The mountain rose about 6.8 centimeters in 2003 and 2004, and the ratio of helium-3 [3He] to helium-4 [4He]—'a good indication of magma activity because the source is the mantle'—nearly doubled during that time." The article noted that the CEA has proposed a major upgrade of its Tianchi caldera monitoring network to begin next year. References. Horn, S., and Schmincke, H., 2000, Volatile emission during the eruption of Baitoushan volcano (China/North Korea) ca. 969 AD, Bulletin of Volcanology, v. 61, pp. 537-555. Machida, H., and Arai, F., 1983, Extensive ash falls in and around the Sea of Japan from large late Quaternary eruptions: Journal of Volcanology and Geothermal Research, v. 18, p. 151-164. Stone, R., 2010, Is China's riskiest volcano stirring or merely biding its time? : Science, v. 329, p. 498-499. Zou, H., Fan, Q., and Zhang, H., 2010, Rapid development of the great Millennium eruption of Changbaishan (Tianchi) Volcano, China/North Korea: Evidence from U-Th zircon dating: Lithos, v. 119, no. 3-4, p. 289-296. Massive Changbaishan stratovolcano, also known as Baitoushan and by the Korean names of Baegdu or P'aektu-san, is a relatively poorly known, but volcanologically significant volcano straddling the China/Korea border. A 5-km-wide, 850-m-deep summit caldera is filled by scenic Lake Tianchi (Sky Lake). A large Korean-speaking population resides near the volcano on both sides of the border. The 60-km-diameter dominantly trachytic and rhyolitic volcano was constructed over the Changbaishan (Laoheidingzi) shield volcano. Satellitic cinder cones are aligned along a NNE trend. One of the world's largest known Holocene explosive eruptions took place here about 1000 CE, depositing rhyolitic and trachytic tephra as far away as northern Japan and forming in part the present caldera. Minor historical eruptions have been recorded since the 15th century. This volcano is located within the Chaingbaishan, a UNESCO Biosphere Reserve property. Dunlap C E, Gill J B, Palacz Z A, 1992. U/Th disequilibria in the large-volume chemically-zoned eruption of Baitoushan, 1010 AD (abs). Eos, Trans Amer Geophys Union, 73: 611. Horn S, Schmincke H, 2000. Voltatile emission during the eruption of Baitoushan volcano (China/North Korea) ca. 969 AD. Bull Volcanol, 61: 537-555. Liu R, Wei H, Li J, 1992. Volcano at Tianci Lake, Changbaishan Mt.--the potentially most dangerous volcano in Chinese mainland. 29th Internatl Geol Cong, Kyoto, abs, 2: 501. Machida H, Moriwaki H, Zhao D, 1990. The recent major eruption of Changbai volcano and its environmental effects. Geog Rpt Tokyo Metropolitan Univ, 25: 1-25. Ogura T, 1969. Volcanoes in Manchuria. In: Ogura T (ed) Geology and Mineral Resources of the Far East, Tokyo: Univ Tokyo Press, 2: 373-413. Sakhno V G, 2007. Chronology of eruptions, composition, and magmatic evolution of the Paektusan volcano: evidence from K-Ar, 87Sr/86Sr, and delta18O isotope data. Doklady Earth Sci, 412: 22-28. 1903 Apr 15 ± 45 days Unknown Confirmed Historical Observations Liuhaojie tuff ring? 1702 Jun 9 Unknown Confirmed Historical Observations Wuhaojie? 1668 Jun Unknown Confirmed Historical Observations Bagumiao ignmibrite and pumice? There is data available for 7 deformation periods. Expand each entry for additional details. Reference List: Xu et al. 2012. Reference List: Du-Xin et al. 2007. Du-Xin, C., Qing-Liang, W., Ke, L., Wen-Ping, W. and Ya-Xuan, H., 2007. Analysis of recent deformation of Changbaishan Tianchi volcano. CHINESE JOURNAL OF GEOPHYSICS-CHINESE EDITION, 50(6), pp.1731-1739. Reference List: Chen et al. 2008. Chen, G.-H., X.-J. Shan, M. M. Wooil, and K.-R. Kim, 2008. A modeling of the magma chamber beneath the Changbai mountains volcanic area constrained by InSAR and GPS derived deformation. Chinese J. Geophysics, 51, p. 765-773. There is no Emissions History data available for Changbaishan. Scenic Lake Tianchi (Sky Lake) occupies the 5-km-wide, 850-m-deep summit caldera of massive Changbaishan stratovolcano, which straddles the China/Korea border. The volcano is also known as Baitoushan and by the Korean names of Baegdu or P'aektu-san. This view looks from the northern rim on the Chinese side towards the SE caldera wall on the Korean side. One of the world's largest known Holocene explosive eruptions took place from Changbaishan about 1000 CE, depositing tephra as far away as northern Japan. Photo by Xiang Liu, 1983 (Changchun University). Water draining from Tianchi lake plunges over a mid-Pleistocene trachytic lava flow near the caldera rim on the upper northern flank of Changbaihan (Batoushan) volcano. Photo by Xiang Lui, 1983 (Changchun University). There are no samples for Changbaishan in the Smithsonian's NMNH Department of Mineral Sciences Rock and Ore collection. Large Eruptions of Changbaishan Information about large Quaternary eruptions (VEI >= 4) is cataloged in the Large Magnitude Explosive Volcanic Eruptions (LaMEVE) database of the Volcano Global Risk Identification and Analysis Project (VOGRIPA).